People were building with wood in what is now Latvia long before masonry architecture arrived in the late 12th century, and even after this wooden architecture continued to coexist with stone and brick buildings. Until the middle of the 19th century Riga was a fortified city, and according to the regulations, buildings in the districts beyond the walls and bastions could be built only from wood. This was because if there was a war, the wooden suburbs would be burnt down so that the enemy wouldn’t have a place to hide. The last time that happened was in 1812, when Napoleon’s army was marching through this territory and the wooden suburbs were burnt down after the military governor of Riga, Johann Magnus von Essen, received false information that he was intending to invade the city. As both Riga’s role and the means of fighting wars changed over time, it was decided that this system was no longer necessary and between 1857 and 1863 the city walls were destroyed, and at the same time the rules regarding the suburbs were changing, meaning that masonry buildings were now allowed as well. In many cases, however, the surroundings of Riga were build in wood long after that, partly because it was much cheaper and faster to build a wooden house than a masonry structure. The city’s infrastructure also affected the choice of the material: in Āgenskalns, for example, there was no water tower until 1910, which meant that people had to carry water from the water pump and then up the stairs. Apart from these practical reasons, a hundred years ago, as today, people tended to seek a natural environment. Riga’s wooden suburbs were one of the reasons that UNESCO included the city in the World Heritage List, saying that the medieval and later-period urban planning structure of the historic centre of Riga, as well as the quantity and quality of Art Nouveau architecture, which is unparalleled anywhere in the world, and the 19th-century wooden architecture make it of Outstanding Universal Value. However, the wooden architecture has often been unappreciated and while many of Riga’s masonry buildings have been studied closely, a lot of the wooden houses have been neglected. This article concentrates on one area of Riga, Āgenskalns, where a lot of our city’s wooden architecture has survived up to this day, not only separate buildings but whole districts. These show the different stages of Riga’s development. 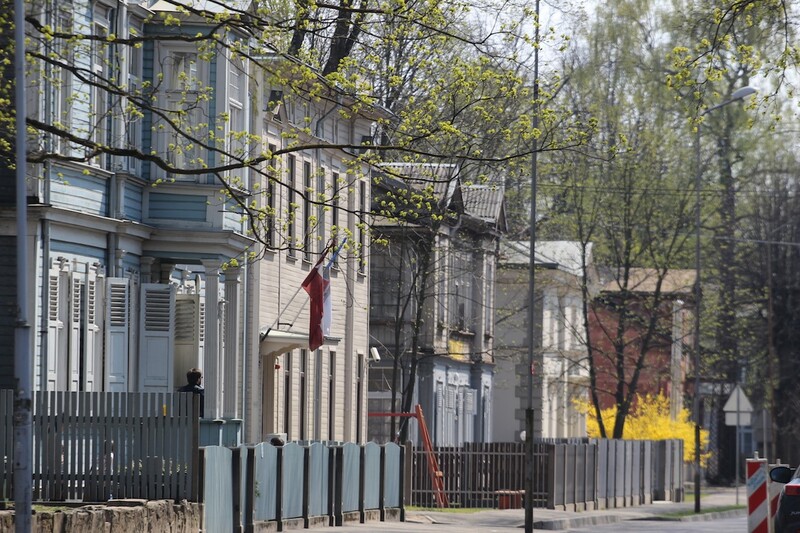 Two out of the five of urban monuments in Riga protected by the State Heritage department are located in Āgenskalns: the wooden houses of Kalnciema Street and a fragment of “Old Āgenskalns”, which makes Āgenskalns a great place to get familiar with Riga’s wooden architecture. The history of the wooden houses can’t be traced back as far as the oldest brick structures of Riga. Some of the oldest wooden buildings of Āgenskalns date back to the 18th century, when the fortified city on the right riverbank became too noisy and crowded and those who could afford it had a suburban manor house built close to the city, most often on the right river bank called Pārdaugava (which literally means “across the (river) Daugava” in Latvian). A lot of the manor houses were located next to transport roads, and that’s why many of Āgenskalns’s oldest buildings are found on the ancient traffic roads nowadays known as Kalnciema Street and Daugavgrīvas Street. One of these manors, 25 Daugavgrīvas Street, belonged to a Riga patrician, Carl Berens, and was called the Schöngesicht (the “Beautiful View”), and later, the Hey’s Manor. In the second half of the 18th century, two famous philosophers often visited Berens and stayed at the manor: Johann Georg Hamann and Johann Gottfried Herder. Behind the rather simple building there was an alley with a hilly terrain that offered beautiful views across the Daugava. Carl Berens used to take long walks there, together with his visitors, which is why the locals called this area “the Philosophers’ Alley”. Unfortunately, the manor has not survived: it was already in bad condition during the Soviet times and in the ’90s it was torn down. The Philosophers’ Alley was destroyed a long time ago and now there is a highway with ongoing constructions of a high-rise building called “Philosophers”. Some other 18th-century buildings in Āgenskalns have had better luck. One of the best-preserved complexes of ancient wooden houses is Hartman’s manor, located at Kalnciema 28/30. The whole ensemble illustrates two different styles of Riga’s architecture: baroque and classicism. This building with a mansard roof is the oldest of the ensemble; it is thought that it was built in the second half of the 18th century. The historical styles of the wooden buildings can be seen in the volume and the silhouette of the structure, the shape of the roof and the colour as well as the decoration of the doors and the windows. Hartman’s manor, with its blockwork construction and a chimney in the centre of the building, is still close to the local rural traditions of wooden buildings (you can see similar structures in the Ethnographic Museum). The element that gives balance to the proportions and also indicates the baroque style is the high, massive roof, containing two different storeys. Another typical feature for ancient houses that stood next to transport roads, is the lack of an entrance from the street. The entrance was usually at the back of the building to give more privacy to the dwellers. The structure on the right, a gallery with four white columns, and the part of the house with three windows and a high roof, is quite typical of classicism and is thought to have been built in the early 19th century as a hall for dancing. The family that owned the property wanted to modernise their manor, so in the very late 18th century they built another manor house deeper into the park area. It is a yellow two-story building with white decorations – rather simple overall, but with beautifully decorated doors and other details. This complex, as well as some maintenance buildings, and the park that lies at the back of it, is a testimony of how Rigans used to live and build more than two hundred years ago. Moreover, it is also an important example of how a historic building can be lived in and made accessible to people. The interiors were mostly destroyed during the Soviet times but what was left has been preserved; the buildings show the original materials, colour and details and what is most surprising is that it houses a shop for active tourism, Gandrs. In the yard there is a tower for climbing; there are also offices, workshops for fixing bikes, and it is completely alive. Most of the wooden houses of Āgenskalns that have survived to this day were built in the late 19th and early 20th century, coinciding with when Riga experienced its biggest growth: in 16 years the population of Riga almost doubled, due to growing industrialisation and the importance of the port of Riga. Manors were still being built in the 1870s, but they were now called villas. One of the most beautiful neo-renaissance villas is still standing: Schwarzhof (Švarcmuiža in Latvian), which was built in 1872 by Matias von Holst, since the family of Schwarz owned a lot of land in Āgenskalns. The manor was designed together with a landscape garden that surrounded it, just next to the Philosophers’ Alley with a spectacular view across the river to the city of Riga. Not everyone could afford a villa but many people wanted to escape the fuss of the industrial city, so a new trend developed: constructing summerhouses. They were more simple, and were sometimes divided into two, four or even more apartments, but the idea was the same – to live in a more relaxed environment with a garden in the backyard, and a terrace or, more often, a veranda. There were only a few factories in Āgenskalns, which made it an even more attractive place for those searching for peace and quiet. There was also everyday ferry traffic between the two riverbanks, as well as other facilities to enable a comfortable life such as a marketplace, a police station, a post office, both a Lutheran and an Orthodox church, a summer theatre and a restaurant, as well as bars and shops. During the winter, people used to ski from the small hill covered with pines which was later levelled and built on in the Soviet times and which is now known as Āgenskalna priedes. The architecture of the buildings from the late 19th and early 20th century was mostly inspired by classical architecture, which was considered to be a more representative style, but in the early 20th century some Art Nouveau houses with very original details were built as well. In the late 19th century, another type of housing was introduced to the urban structure of Riga: workers’ barracks. These were simple buildings with almost no decorations and a gallery-type plan where each apartment has only one room and a kitchen. In Āgenskalns, structure of this kind can be found mostly in “Old Āgenskalns” and near a few former factories: the rubber factory, the cork factory and the wallpaper factory. Approximately 600 buildings in Āgenskalns are built from wood. This type of construction material is much more fragile than brick and stone, and so wooden houses have often been subjected to many changes. Nonetheless, there are some great examples of restoration and conservation of the wooden buildings. One of the most visible and inspiring examples is the Kalnciema Quarter, where several wooden houses have been saved, and which is now is one of Āgenskalns’ hubs, housing a Saturday market every week and concerts during the summer season. The restored interiors of Māja restaurant even give visitors an opportunity to see the original colours of the walls and the stoves, as well as to experience the cosy feel of being in a wooden house. Other private owners do what they can to keep their property in the best shape possible, appreciating both the romantic details of the buildings and the beautiful, peaceful environment of Āgenskalns in general. There is a lot of evidence to demonstrate that interest in wooden architecture is growing: in 2006, before a NATO summit in Riga, state institutions, in collaboration with private individuals and Latvia Nostra, initiated a project to restore the buildings of Kalnciema Street; in 2013 the Wooden Building Renovation Centre, Koka Rīga, was opened; in 2014, Zaiga Gaile received the Latvian Grand Prize of Architecture for the restoration of the wooden building on Lāčplēša Street which houses a department of the Riga School of Design and Art; and recently the Wooden Architecture Foundation was created in Kalnciema Quarter. However, reality shows a sadder picture: wooden buildings are sometimes torn down, and sometimes, even if the city doesn’t give permission for them to be pulled down, they are burnt down, or are changed irreversibly, losing their original proportions, details and even materials. It seems that the city has neither the interest nor the resources to work out and follow a consistent plan for protecting its wooden houses. Laura Plūmiņa is a graduate of the History of Art department at the Latvian Art Academy, and she specialises in the research and protection of Riga’s wooden architecture. She is also co-founder of the tourism company Travel Jam. Thank you for the great article. In 2013, I visited Latvija and spent several days in Liepaja. While there, I noticed and photographed many wooden buildings in the downtown area there. I hope that these and other similar buildings in Latvija will be preserved.